I have a lot to say about having pigs in the orchard and have been compiling my notes all summer long for a later, longer essay. Today, however, I want to talk about an unexpected happening of the pigs. A couple weeks ago, I made the decision to move the pigs out of the orchard and into a new series of paddocks behind the one-day-soon Greenhorns headquarters. This decision came because the timing of harvest was getting difficult with pig rotation, so I figured it would be best to remove them from the orchard for a few weeks. Luckily, the Greenhorns HQ is only a pasture and a backyard away from the orchard so the move was about an eighth of a mile away. Armed in running clothes with a quart Ball jar full of grain (for noise making), I had Shizue (the newest hire of Greenhorns!) lift up the gate of their old pen and I started to jog across the pasture. As expected, the pigs followed me and eventually fell into a hilarious single file line with Mortimer, the 8 month-old boar, leading the group. If ever I have felt like the pied piper, that was the day. Before reaching the new paddocks, we ran through Doug and Yvonne Sears’ backyard, where they were standing on the back porch whooping with laughter and clapping as we passed. I guess its not everyday you see a line of little pigs run through your backyard. Over the course of this summer, I’ve gotten to know Doug (turns 90 this November) and Yvonne (age undisclosed) and they have been wonderful neighbors. They have been married for 65 years and are still so very in love that it makes my face melt to witness it. Ginger, my large French Mastiff, broke the ice with them early on by walking into their house uninvited and asking for a dog bone in her sad faced “I’m going to sit and shake my paw for you” manner. Ever since, Doug and Yvonne have welcomed me and the dog and whomever is accompanying me over for dinner, conversation, a vodka-tonic, or just a quick catch up on the day’s events. It has been really nice to become friends with them. Doug, a faithful cutter of grass on his riding lawnmower, cuts our headquarters front lawn without asking because he wants to keep us out of the “You redneck; your grass is too long” judgement zone from passerby’s (a zone I really don’t care about, but that doesn’t matter). With that same riding lawnmower, Doug has also helped me to cut paddock lines to place my electric fence, saving me at least an hour of labor. I’m grateful for Doug. After witnessing the pigs run through their backyard, Yvonne developed a burning interest in them. She told me a couple weeks ago that as soon as it’s light enough to go outside, she goes and says hello to them. She returns throughout the day, often with leftovers from breakfast, lunch or dinner to give them. The pigs, who I believe to be the happiest animals on earth, come bounding from wherever they are to tell Yvonne hello! and that SHE IS THE BEST THING EVER. Yvonne adores those pigs. Yesterday she confided in me that she has had a bad back over the past year and with the rain and the cold weather that dominates this climate, she has not been able to do the walking necessary to heal. (She also confided in me that her lack of activity is built on excuses). 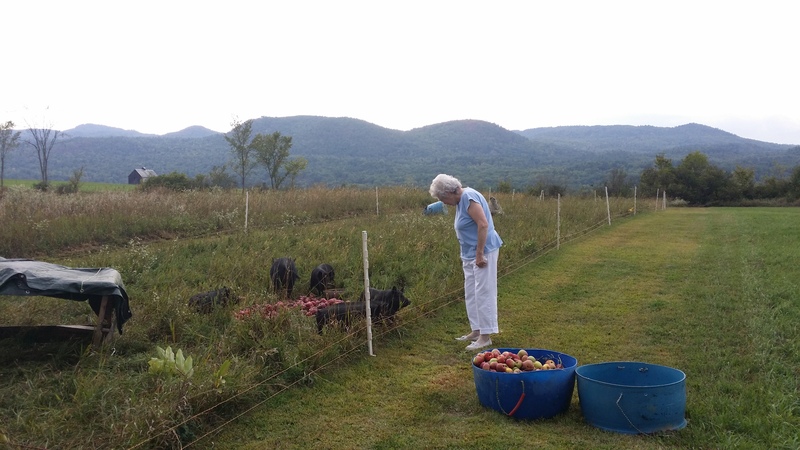 Ever since I moved the pigs out of the orchard and to a place that is easily accessible for her to walk, she’s been walking more than ever and enjoying every minute of it because it involves seeing the pigs. Her back is feeling better. Doug says she spends more time with the pigs than she does with him. And today she informed me that the pigs love radishes, lettuce, turnips, and mashed potatoes. I’m often guilty of getting wrapped up in the management aspects of farming. How can X benefit Y and Y benefit X without costing me more money? What are the yields? Etc. Today was a reminder that small scale farming can and should hold more than that. It can unexpectedly bring happiness and joy to those surrounding us and even give someone a reason to put on their shoes, grab their cane, and go for a walk as soon as the sun comes up. I spent three months as an intern on an organic farm. They had pigs and a few other animals I hadn’t experienced raising/living with and I found myself falling in love. I came to completely adore the pasture raised piggies and established quite a relationship with one (Angie) in particular. Pigs are an absolute delight to raise and spend time with. Your post made me smile and I thank you for writing it. I am happy you have happy pigs that you care for and I am happy they have made way to warming the heart of the neighbors as well. In certain farm-business oriented circles that I run in I used to be embarrassed to say that I don’t care if I am making any money with livestock, because I love what animals do for me. I have even gone to the extent of trying to quantify the $ value of the “fringe” benefits that animals give us. I am now coming full circle and I am less defensive to the economics. Stories like this help to remind us the value of livestock far surpasses anything that our silly broken economic system can measure. Awww this post warms my heart – pigs are the best! Children and grandchildren. We all know how they enrich our lives. Few of us get to experience how animals, pigs, chickens, cows, can bring joy to our lives. Farm living is the best! Thanks for the great story.